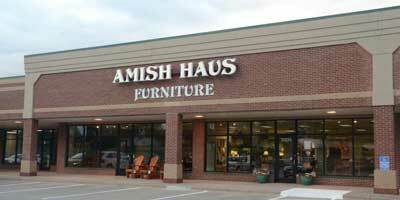 Amish Haus Furniture where tradition still dictates that each piece is cut, shaped, and sanded by craftsman here in the Midwest. You’ll find many styles to choose from, each made to the same exacting standard. Customize your furniture by choosing your favorite wood, stain and hardware. Locally Owned and featuring products made in the USA. Judy was awesome and your delivery guys were great! Always willing to do whatever it takes to get the product to what you want. Well laid out showrooms, displays, and information hubs! and Beautiful furniture & well crafted. Found furniture we did not find elsewhere. I did not know you had so many styles of furniture! Ordered the B&O railroad trestle table. We've had a lot of compliments on how beautiful it is, this table is a must have. Thanks to Pam for her patience and working with us. Thank you for helping us find the right table and chairs for our family!! Outstanding service! Just bought new furniture for my bedroom and it is the most gorgeous furniture; I felt like it was Christmas morning since I waited for10 weeks for them (Simplyamish) to custom make it. Simply beautiful! Delivery guys were awesome as well!